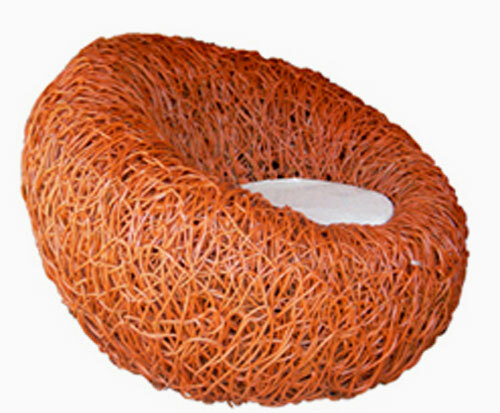 Looking like huge modeled loofah scrubs, some of the seating designs by Project Import Export (PIE) Studio may look, at first, like misfits for home interiors But the furniture lines are sensual, the shapes are contoured, and with a few cushions they look really smart and very comfortable. 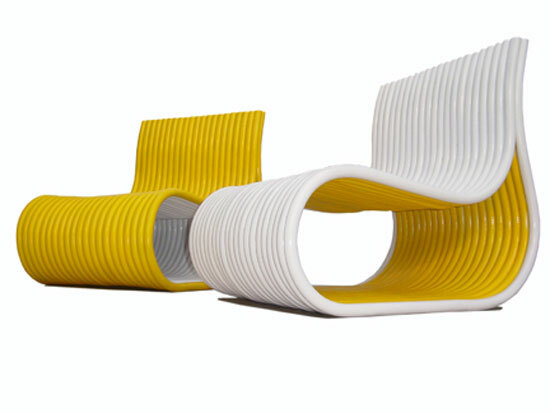 Architect come furniture designer Bannavis Andrew Sribyatta founded PIE in 2005 and has been making big splashes since. Not with loofa though. 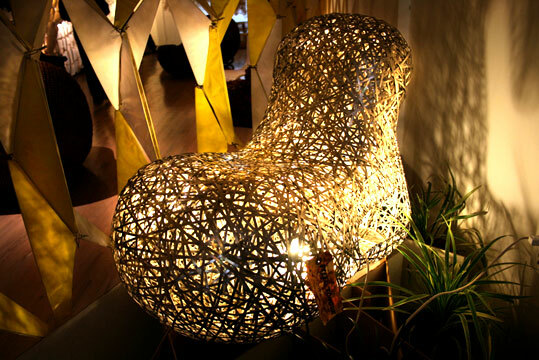 Sribyatta makes handcrafted furniture from other natural fibers like bamboo, rattan, water hyacinth and liana. Instead of using trees that are becoming endangered, Sribyatta is using the fasted growing fibers in the world to create furniture. Water hyacinth and liana are great examples of economic use of available resources. These are two fibers that are so plentiful, they are largely harvested as waste. PIE design is hot and you will see why! 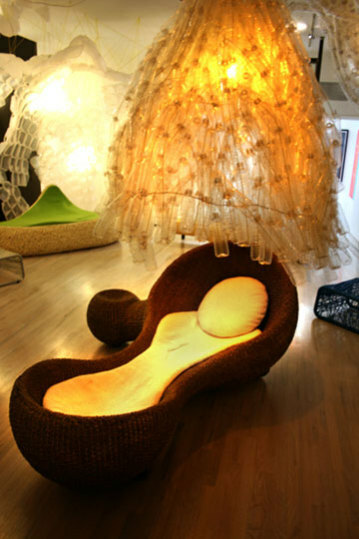 The photo below, shot at PIE Studio's Bridge Gallery exhibit during Design Week in NYC, features the Sushi Daybed made of water hyacinth, a still-water growing "weed" that can kill water life if left unharvested... but makes fabulous furniture! Lit up for the display! 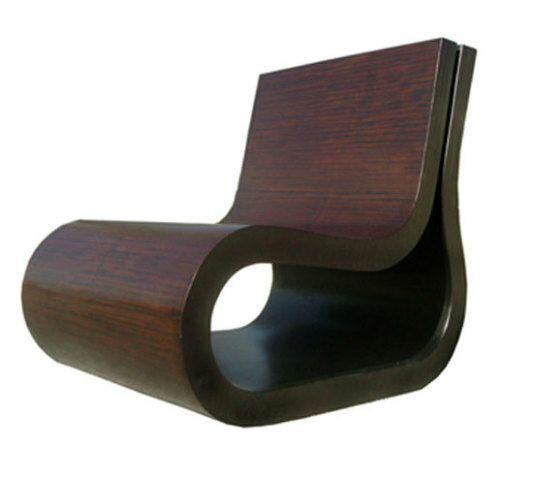 The Pearl is made of synthetic material so that it can be used for indoor or outdoor use. 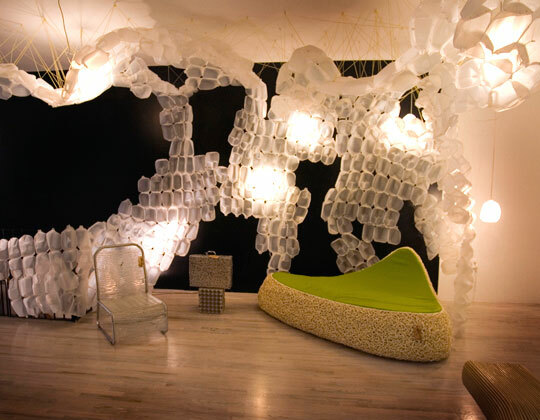 The lighting display is made from recycled one-gallon plastic milk jugs. Cozy like a crib, the Tonecoon is shown below in water hyacinth. The "dreadlock" chandelier above the Tonecoon is made of recycled PET water bottles. 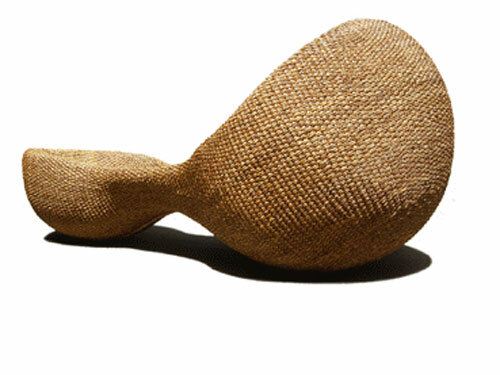 Here is another view of the Tonecoon; the water hyacinth has a smooth tight weave. 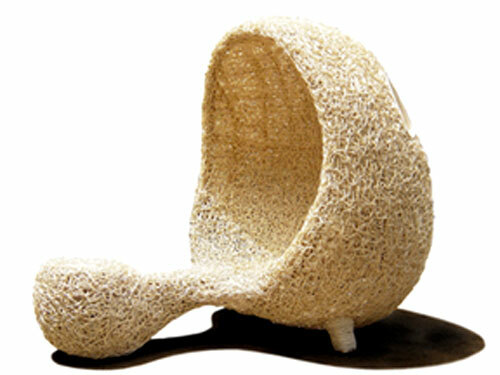 A great pod for snoozing or listening to music, the Hedgehog is made of rattan, a popular tropical fast-growing plant that's been used in furniture making for centuries. Shown first in bamboo, the Stomach presents a richer, heavier look than some of the other natural fiber chairs, but then bamboo is considered more of a wood. Nicely stained! For a lighter look, the next Stomach chairs are in rattan, more appropriate for a playroom or interior porch than the bamboo edition. The spaghetti here is not made from tomato noodles, but from liana, a lanky, tough jungle plant that weaves through and up everything. (It's probably what Tarzan swings from.) This particular spaghetti comes in tomato or whole wheat. 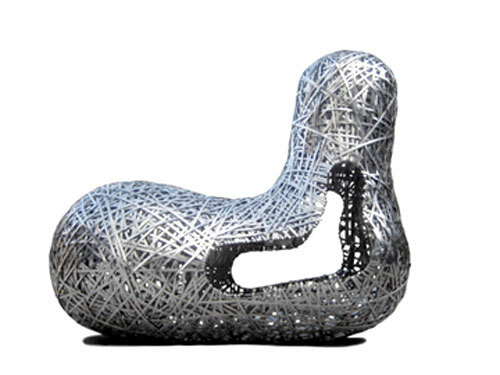 A steel frame and aluminum weave compose this award-winning Steel Tongue Chair, now in the collection of the Cooper-Hewitt National Design Museum of the Smithsonian Institution, NYC. Sribyatta's inspiration this chair came from "a pierced tongue." Most of PIE's designs are available in limited editions as custom orders. You can learn more about them from the PIE Studio website or through Designer Pages.